All of your homes components age with time and unfortunately, may need major repairs to correct Father Times wrath. 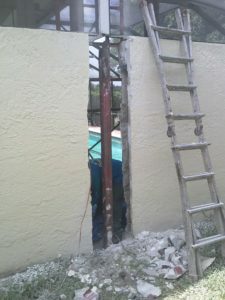 One of these repairs will be a front porch column or pool patio post. If you have a damaged column holding up a front or back porch, a high wind event like a hurricane or even a summer thunder storm could cause the supporting member to fail and even bring down the roof it supports. Replacing a broken, rusted or otherwise damaged column is not as easy a job as you might think. But don’t worry, we’ve been replacing support columns for decades. You can have one of our expert crews replace your Patio column and never worry about it again. Before replacing your porch column with a new and improved one, we first have to remove the old column. The column to be replaced is supporting something like a heavy roof and so, a temporary support will need to be installed. We use roof jacks and or scaffolding to do the job, but sometimes we use wood 2x4s or 4x4’s. Wood supports need to be cut to size (an inch or so longer than the column) and hammered into place. Roof jacks are more sturdy and can be adjusted to just the right size without the need to be hammered into place. This may limit additional damage to the underside of the roof or soffit. Some porch columns are not load bearing and are installed for aesthetics only rather than for structural support. Columns located on corners will most likely be load bearing. 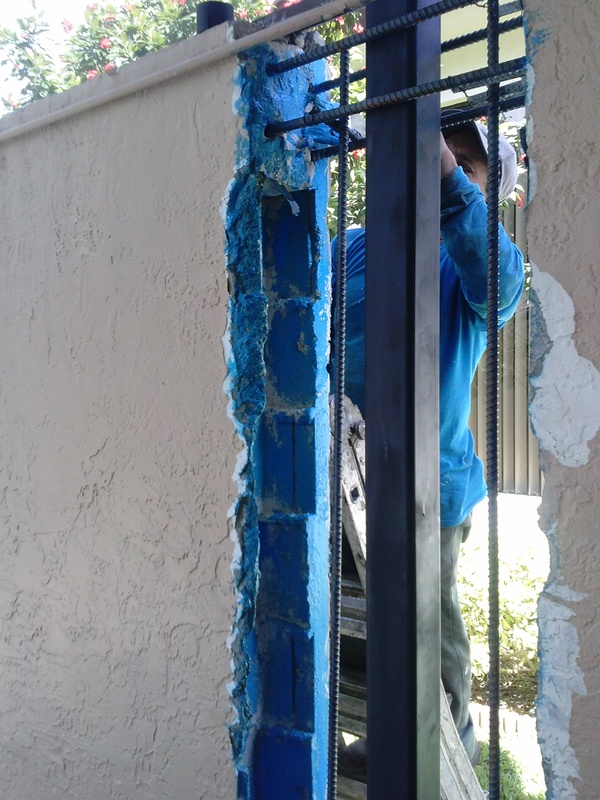 Whether a column is load bearing or not, it’s best to error on the safe side of caution and brace any column with temporary supports before removing it. When we “jack-up” a roof with a roof jack, we will place a small piece of wood on the top of the jack and under the roof. This will allow for more surface area on the jack and will distribute the weight better. With the temporary roof support is in place, we will mark the footing of the column and where the column will attach to the roof. These will be reference points for the installation of the new column. If your column is attached to a guard or hand rail system, we first need to detach the rail from the column in order to proceed. The rail may need to be temporarily supported until it can be reattached to the new column. We have choices in removing the old column. We will remove any casing or trim at the top and bottom of the column. The pieces are sometimes secured with wood glue, or nails, or both. Removing them can cause damage beyond repair and so, we may need to fabricate new ones. Once the casing is removed the supporting column should be exposed along with whatever connections secure the column to the roof and porch. If a flange was used for attachment, we will remove the screws to disconnect the column. Sometimes other methods of attachment are used and we simply cut the column out with a reciprocating saw. Porch columns are generally made from wood, steel, concrete or aluminum. Selecting the right material for a replacement column is critical. Wood is inexpensive, but wood always develops splits and can even warp. While many home owners would prefer to utilize wood for a new patio support column, we strongly discourage its use. Over the years we have replaced many wood supports with new 4x4 or 6x6 wooden posts. In way too many of these cases we have been called out to look a crack in the wood months or years after instillation. So, while many people think they want an inexpensive wood column replacement, they are not always happy with one down the road. Steel is a good choice because of its strength. And while steel can be painted to prevent rusting, the base of a steel support column is bolted or sunken in concrete. Over time this steel touching the concrete begins to rust. Rusting steel makes a really big messy and we discourage the use of steel for replacement columns. 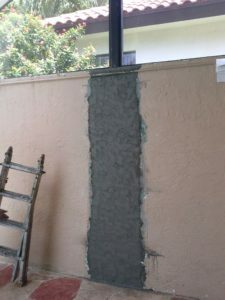 Concrete is a very good choice because it does not split, warp or rust. However, concrete posts are very heavy and transporting them becomes a little more difficult than other material choices. And finally, there is aluminum that can be used to make new support columns. Aluminum is the perfect choice. It is light weight, very strong and it does not split warp or rust. Preventive Maintenance Support Services Company uses aluminum posts for all of our replacement patio column replacements. We shop fabricate an aluminum “perch” to attach the new column on the top to your trusses or rafters. The we bolt the base on the concrete foundation below. 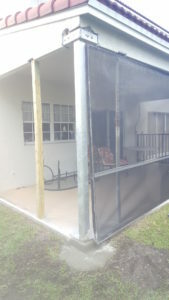 Our mobile welding team then comes in and welds 3” or 4” aluminum box tubing to act as the replacement patio post. Our customers are very happy with the results. While they may cost a little more than a wood post, they will last for as long and you own the home.